Need more Brace Gard silicone strips and analegsic gel for your Brace Relief Pocket Kit? We have a refill for that! This double refill pack contains 8 rods of Brace Gard Silicone and 2 tubes of Brace Relief Analgesic Gel. 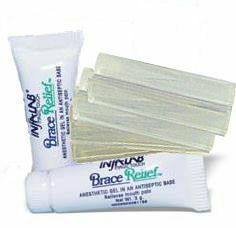 That's double the amount of product that is originally included in the Brace Relief Pocket Kit. Please note: the silicone rods are bare on a plastic sheet. They are meant to be housed in the Brace Relief Pocket Kit or some other small hard case. The case is not included with this refill. Brace Gard dental silicone works just like OrthoSil -- you need to dry your brackets thoroughly before applying it, or it will not stick. Place the Brace Gard silicone over TOTALLY DRY brackets. Pinch the top and bottom of the silicone to lock the material around the edges of the brackets. Finish by smoothing it with a wet finger. Brace Gard silicone doesn't get hard or crumble like regular dental wax. You can remove and reapply it, and even mold it across several teeth at once to form a protective mouth guard. Brace Gard silicone is totally transparent and will not "melt" when you consume hot liquids or hot foods. The analgesic gel comes in a small resealable tube. Use it whenever your teeth or gums hurt. You get 8 large extra-thick rods of Brace Gard orthodontic dental silicone and two 3-gram tubes of analgesic gel. This is a refill for the Brace Relief Pocket Kit. The refill does NOT include the case. At first I was confused why would the refill pack be more money that the original product but I realized ( and now thinking I was an idiot) that this is a double refill and gives you twice as much as the original product! This was helpful and I especially love the gel because it numbs the pain of my cheeks.